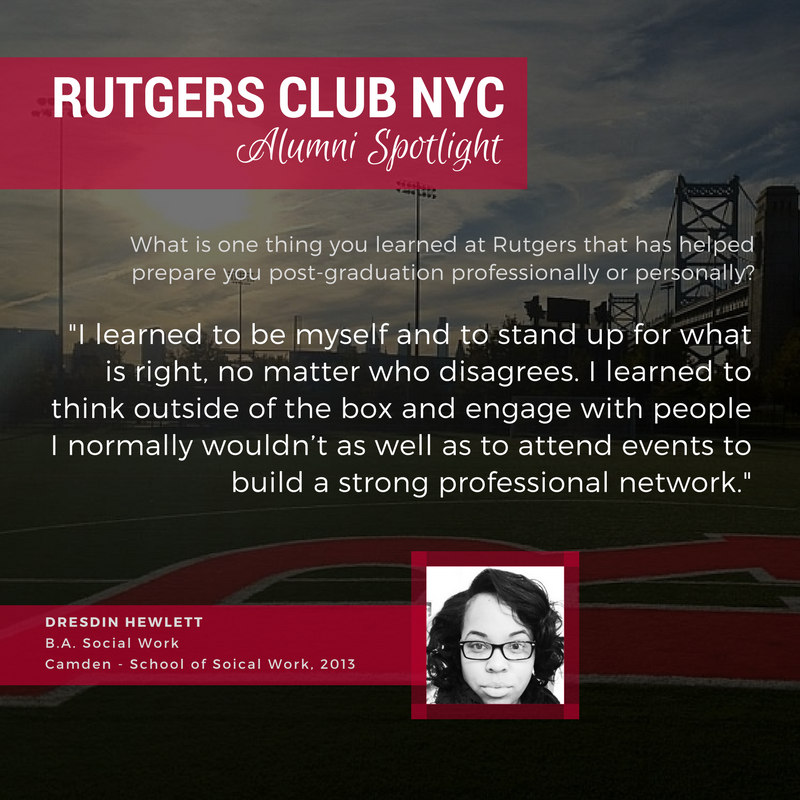 What is one thing you learned at Rutgers that has helped prepare you post-graduation professionally or personally? : I learned to be myself and to stand up for what is right, no matter who disagrees. I learned to think outside of the box and engage with people I normally wouldn’t as well as to attend events to build a strong professional network. What is a part of your identity that you discovered while at RU (passion for something, political beliefs, etc)? : I discovered my passion for mentoring inner city youth while attending RU! Initially it was part of an internship for a class but it turned into something I really enjoyed and continue to do on my own. How has your Rutgers education or network help get you where you are today? : The Rutgers network is strong and alumni really look out for each other. There have been quite a few reasons why RU networking has helped me, from my beloved Sorority Sisters constantly encouraging me to reach my highest potential or even just being a listening ear..without RU I would not be a part of such a beautiful group of smart, beautiful and educated women. I was also hired at my undergraduate internship by my site supervisor, who was also a graduate of RU ! I was chosen over many other candidates based on my professional work ethic, as well as my affiliation with RU! If you could share one piece of advice with a current freshman, what would it be? : I would say get out and get active on campus. Attend programs and events that you normally would never see yourself at, and meet new people with different interest than you. That is the best way to build a strong and diverse network!!! Final thoughts or reflections? : Have fun, and study hard! College passes by quickly so make sure to enjoy the social aspects while learning all that you can.